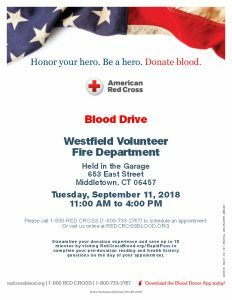 Westfield Fire Department is partnering with the American Red Cross to host a 9-11 Memorial Blood Drive to be held on September 11th 2018 from 11am – 4pm at the Westfield Station. The drive is being held in honor of the 343 FDNY members who lost their lives trying to rescue occupants of the twin towers when they collapsed. To sign up to donate blood at our local blood drive please call 1-800-RED-CROSS (1-800-733-2767) or on sign up on line at REDCROSSBLOOD.ORG. If you have any questions, please contact Lt. Phil Coco at 203-410-0003.